I understand the issues you raise. I've long heard these same concerns and needs discussed on the ebXML messaging work. The ebMS v3.0 has new features that are specifically designed to support sophisticated message handling and routing and trust issues. Perhaps this is something we could direct to that committee for insights given the use cases you mention. Also - I believe we do need to decouple transport from packaging and content WRT specification standards. Obviously CAP does not need to reinvent the wheel here. Perhaps one way forward here is to have suggested transport and delivery profiles. I know other standards groups work has used that very successfully. Therefore you could have profiles for using WS* stack, and then ebXML - and then implementers could select what profile meets their needs. BTW - the new ebMS v3 also has significantly improved ability to deliver via WS* channels (obviously where these are solely end points only and not routing channels). Lastly - I want to say I appreciate you raising this all - because I attended a present by FEMA the other week - and was concerned that these aspects were not being covered - and especially malicious or runaway scenarios - such as those that crippled the power grid in times past. We know these things can occur - and therefore we should take necessary precautions to safe guard infrastructure accordingly. Cc: "'Oien, Chuck'" <ctoien@sandia.gov>, "'Sanzero, George'"
The open standards communities that created Web services developed a number of security standards for web services. Figure 8 illustrates a notional reference model for web services security standards. This reference model maps the various standards to the functional layers of a typical web service implementation. These layers are modeled after the OSI Reference Model but are not intended to be interpreted as strictly hierarchical. Standards at the network, transport and XML security layers are used to secure messages as they are transmitted over the network. The security standards IPsec, SSL/TLS (Secure Sockets Layer/Transport Layer Security), XML Encryption and XML Signature each operate on SOAP messages at a different level. Above the XML Security layer standards fall into two primary categories: standards that are built on top of SOAP and standalone standards. 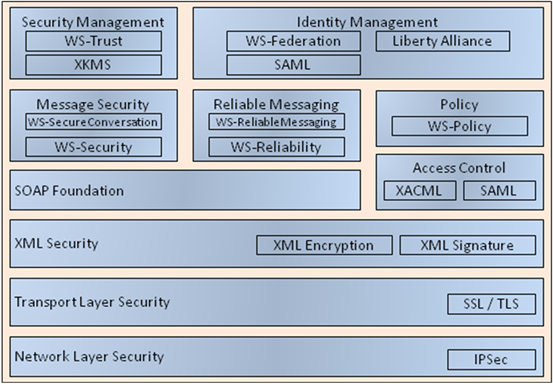 Message security standards WS-Security and WSâ€‘SecureConversation define how to use XML Signature, XML Encryption and credentials to secure SOAP at the message layer while reliable messaging standards define the protocols and constructs necessary to ensure that messages will be received. The access control standards are not unique to web services; XACML can define the access policy for any system and SAML can be used to define assertions in any environment. At the policy layer, WS-Policy defines a grammar to communicate policy requirements of a web service. Security management specifications define other Web services to manage credentials such as PKI certificates within the SOA. Identity management standards take advantage of access control standards, policy standards and SOAP standards to offer services for distributing and managing user identities and credentials within the SOA. The Digital Signature provides message integrity among a serviceâ€™s exchange partners. Digital signature provides a mechanism for the authentication of messages, allowing a consumer to make certain that a message has not been tampered with during transit. A digital signature should be applied to the service header and the message body. As the message travels, service requests and responses are signed at each ESB. A digital signature establishes a chain of trust between components and enables non-repudiation and authentication of messages. Digital signatures should be based upon open source and accepted federal standards. Digital signature should be based upon the Web Services Interoperability Organization (WS-I) Basic Security Profile, which provides an interoperable framework for major security standards to effectively work together. â€¢ XML Digital Signature (XMLDSig) provide syntax and processing standards. â€¢ Web Services Security (WS-Security) is an XML extension to SOAP which provides a flexible means to employ security measures in messages. WS-Security with XMLDSig is used to secure basic end-to-end authentication and message integrity while remaining transport independent. By implementing XML digital signatures through WS-Security standards, the message header framework maintains interoperability between components with an added level of audit-ability and security. Used in conjunction with other security measures, such as Secure Socket Layer (SSL), messages can be secured and authenticated. Table 2-1 shows which security requirements are satisfied by various specifications and standards. In this table, each security dimension encompasses one or more security requirements. Each requirement may have one or more standards that support it. For example, SSL/TLS and WS-Security provide confidentiality, integrity and authentication support for the messaging dimension. A notable exception is the accountability requirement in the resource protection dimension which does not have any supporting standards. First, Sandia presented during the IPAWS program the reasons for creating a true publish/subscribe capability for public alert and warning. This meant both individuals (e.g. subscription services) and jurisdictions (city, county, tribal) could select the levels of information they wanted to receive via various communications media. This implied a decoupling of the Alert Publisher and the Alert Consumer (e.g. SOA loose coupling). It also implied a significant number of redistribution capabilities managed by both Federal and Commercial entities. During discussions with FCC, the issue of non-repudiation and liability for distribution of misleading or spoofed Alerts was emphasized. These concerns implied a design which was well suited for using the OASIS EDXL-DE distribution capability. Yesterday, I arranged a technical discussion with Gary Ham and Rex Brooks to explain some of my concerns with the current schema for CAP 1.2. There has always been the capability to â€œwrapâ€� CAP 1.0 or CAP 1.1 with any appropriate wrapping metadata (e.g. OASIS EDXL-DE, W3C XML signature or encryption techniques etc.). The real question was about the infrastructure to interpret the wrapping metadata (we have a subcommittee dedicated to this). Â· Extracts must come from the XML document contained within the <embeddedXMLContent> element within the current <contentObject> block. Â· All content within this element MUST be explicitly namespaced as defined in the enclosing <contentObject> tag. Â· MUST be a properly formed -escaped if necessary- XML string. Since disclosure control is about only exposing â€œreadableâ€� information to appropriately vetted consumers, there was a need to not only encrypt the data but ensure the recipient was â€œauthorizedâ€� to receive the decryption capability to read the information. This could only be accomplished with PKI or symmetric key technologies and additional distribution infrastructure (e.g. TSG and SPORs). This has significant impacts on the distribution/redistribution capabilities. Gary and Rex cautioned me not to go into technical details but I would be glad to provide selected individuals the reasons why both symmetric and PKI encryption are bad ideas for distributing CAP messages without appropriate wrapping metadata and supporting infrastructure. CAP 1.2 encrypted content could also break OASIS EDXL-DE infrastructure designed to â€œautomaticallyâ€� wrap time sensitive distribution like the TSG/SPOR network used by DNDO. There are many other reasons. There is also a misconception about digital signatures and non-repudiation. It is true that a digital signature can detect the tampering of a message after it has routed through various distribution technologies. However as we have be documenting in the OASIS SOA Reference Architecture Framework documentation, non-repudiation requires Authenticity of delivered message, Proof of intent of message, and Authority of sender to request this intent in a point-to-point transaction and if it uses in a loosely coupled SOA publish/subscribe distribution capability there must also be a â€œTrustâ€� anchor and transmission of trust through the routing infrastructure. Digital Signature can only provide authenticity of delivered message. The CAP Alert structure provides some proof of intent which can be strengthen by usage profiles. But there is no mechanism for determining that the â€œSocial Structureâ€� has authorized the transmission of CAP alert. The OASIS EDXL-DE schema has and SenderRole element but even this must be used with other technologies to bind it with authenticity and proof of its authority from the Jurisdiction in the distributed EDXL-DE message. This is the reason I donâ€™t even like the signing of CAP 1.2 Alert messages because people assert this provides non-repudiation of the transmitted message. I do not believe this could successfully proven in a court of law. This could also create potential liabilities for the distribution/redistribution capabilities if they had some implied non-repudiation responsibilities. Please understand that Sandia is only trying to be an honest broker for development of â€œinternationalâ€� standards per the OASIS charter. We are not trying to block need Emergency Management capability.